Skiing can be quite a dangerous sport, so safety measures are very important. In particular, there is a great risk of getting a head injury in a fall, impact or collision - unless you wear a helmet. A ski helmet can protect you from perhaps as much as 90% of head injuries. Of course there is a wide choice of ski helmets available in the market, so you will have to consider your choice carefully. Things that you might want to consider include fit, style, certification, and the material the helmet is made from, as well as, of course, the price. A full shell helmet gives complete coverage, and helps keep the wind and elements too. Many full shell helmets also have venting to help regulate temperature. Full shell helmets are generally recommended for fast skiing. A short shell helmet gives less coverage but usually comparable protection to a full shell helmet. Short shell helmets are a good choice if you feel uncomfortable wearing a full shell helmet. Competition helmets are of course designed for competitions. If you are serious downhill competitor, you probably want one - but if you are just a recreational skier, you probably do not need one. Youth helmets are of course designed for younger people with smaller heads than adults. Many youth helmets have removable pads which can be used to adjust fitting as the child's head grows - meaning that they can last for a while. When choosing a youth helmet, you should of course be looking for one designed to the same safety standard as adult helmets. 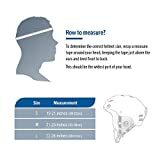 After you know the make and type of helmet that you want, the other issue to consider is the size. A helmet needs to not only be a good fit, but comfortable too. In general, it is worth investing in a decent helmet. Better quality helmets tend to be more comfortable (better fit and better ventilation) as being safer. A good quality helmet can withstand a lot of damage (which would otherwise be damage to your head! ), if you do have a serious accident. Finally, if you take good care of it, for example following only the manufacturer's recommendations of cleaning it, your ski helmet can last for many years. ASTM CERTIFIED SAFETY - Ski helmet built for both comfort and safety. Equipped with REINFORCED ABS SHELL & SHOCK-ABSORBING EPS CORE. ADJUSTABLE SIZE - Size adjustment dial for a perfect fit. EASY TO WASH removable ear pads & inner fleece liner. WHAT YOU GET - 1 x OutdoorMaster KELVIN Ski Helmet, OutdoorMaster's friendly customer service. Ski helmet built for both comfort and safety. Equipped with REINFORCED ABS SHELL & SHOCK-ABSORBING EPS CORE. Sleek design available in 9 different color combinations for you to choose from. All in matte finish. Size adjustment dial for a perfect fit. EASY TO WASH removable ear pads & inner fleece liner. Equipped with 14 individual vents for next-level ventilation for HOURS OF COMFORTABLE SKIING. - To determine the correct size, wrap the measuring tape around the widest part of the head and take the measurement at the forehead. To get the most accurate measure, have a friend help with this. 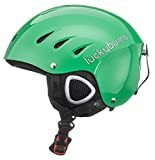 ALL-AROUND PROTECTION FOR YOUR SPORTING NEEDS - The Lucky Bums Sports Helmet is everything you want in a helmet at an affordable price: it's comfortable, stylish, durable, and most of all, functional. It features two protective layers, a padded chin strap, and goggle loop. Ready to go right out of the box, find your size and color today. NUMEROUS FEATURES FOR A FULL AND ENJOYABLE DAY - There's more than meets the eyes with the Lucky Bums Sports Helmet. Inside, the internal fabric lining and ear padding include a hypoallergenic and antibacterial treatment while the ESP inner shell features multiport with mesh screens to allow for ample airflow. DURABLE AND DEPENDABLE WITH MANUFACTURER'S LIMITED LIFETIME WARRANTY - We know how upsetting it is to have your day spoiled by seemly, uncomfortable, and undependable gear. That's why we created Lucky Bums. We believe in our quality and put our money where our mouth is. Each helmet comes with Manufacturer's Limited Lifetime Warranty, which protects against defects in materials or workmanship. Look good, feel good, be protected. The Lucky Bums Sports Helmet is everything you want in a helmet at an affordable price: it's comfortable, stylish, durable, and most of all, functional. It features two protective layers, a padded chin strap, and goggle loop. Ready to go right out of the box, find your size and color today. This helmet has two reinforced layers. The external cap is made from strong ABS material, which is covered by a supporting EPS outer shell for dual protection. This helmet fully complies with EN1077 standards and is CE certified. There's more than meets the eyes with the Lucky Bums Sports Helmet. Inside, the internal fabric lining and ear padding include a hypoallergenic and antibacterial treatment while the ESP inner shell features multiport with mesh screens to allow for ample airflow. 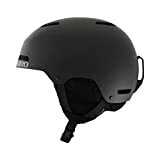 In addition to being vented and hypoallergenic, this helmet is comfortable to wear all day long. Its padded chin strap and integrated goggle loop enhance comfort and function. There are 4 sizes to choose from and each helmet includes a micro adjustable strap for the perfect fit for just about anyone. We know how upsetting it is to have your day spoiled by seemly, uncomfortable, and undependable gear. That's why we created Lucky Bums. We believe in our quality and put our money where our mouth is. Each helmet comes with Manufacturer's Limited Lifetime Warranty, which protects against defects in materials or workmanship. Look good, feel good, be protected. The Ledge helmet features a clean, minimalist skate-style design with Hard Shell Construction built for street and park riding. Under-the-hood muscle meets modern technology with a removable Auto Loc 2 Fit System and ample venting. The Ledge is super modifiable with removable goggle retainer and ear pads to get just the right look. Hard Shell Construction produces great helmets at a great value. A rugged outer shell is molded and then attached to the EPS foam liner. Auto Loc 2 is a durable self-adjusting fit system designed to take the hassle out of fitting a helmet. A supple elastic fit band at the back of the helmet merges with fixed-position straps, which adjust to cradle your head when you set the system to one of the three different circumference settings. The new Vertical Tuning feature helps to dial in your fit and goggle set up. 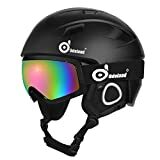 Complete Helmet & Ski Goggles Set: The Odoland snow sport helmet with ski goggles is necessary for anyone loves snow sports. The helmet and the ski goggles effectively provide complete protection to you head. You will have great fun when skiing, skating, snowboarding, or doing other snow sports! Excellent Ventilation: Built with 12 air vent holes for great ventilation.The goggles with Flow-Tech Venting Design not only reduces fogging but also optimizes the flow of air over the inside of the lens. Great for All Snow Sports: Every winter sport lovers must have one Odoland Ski Helmet set with eye-catching goggles. It's not only for skiing. You will get effective protection and ultra-comfort no matter you are skiing, skating, snowboarding or do other winter outdoor sports! Odoland Over-The -Glasses Ski Goggles, is an excellent goggles for men & women, even for people with glasses to enjoy in the ice world with a helmet, whether for skiing, skating or other winter snow sports. With an adjustable strap, people with different head size can wear it perfectly. Dual spherical lenses based on human engineering, not only offer a wonderful view in the enjoyment, but also effectively avoid accidents with anti-fog & professional ventilation functions. UV 400 protection greatly prevents the harmful light and glare. Made with PC and TPU, this goggles is portable and durable. Add to cart, you will like it, then you will enjoy yourself freely in the ice world. 7. Sport type: Skiing, Snowboarding, Snowmobiling, Ice climbing, Alpine Skiing, Ice Skating, Skydiving, Cross-Country Skiing, etc. PROTECT YOUR DOME - Safety certified; Light weight and durable construction fuses the helmets outer shell to the impact-absorbing EPS liner (EPS foam is made in the USA). CLIMATE CONTROL - Adjustable vent on top slides to change how much heat you let out. LIFETIME BREAKAGE WARRANTY - Got a problem? Let us know! We are always here to help and are committed to your satisfaction. 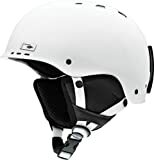 Drift Snowboard & Ski Helmet- US Ski Team Official Supplier - For Men, Women & Youth - Unparalleled Style, Performance & Safety w/ Active Ventilation. Official Snow Helmet of Olympian Ashley Caldwell. OFFICIAL EQUIPMENT SUPPLIER OF THE US SKI TEAM - Wildhorn is a proud supplier of the US Ski Team and Ashley Caldwell. Ashley is the 2017 World Freestyle Aerials Champion (think quadruple twisting BACKFLIPS 60 ft in the air)! The Drift is her helmet of choice for recreational skiing and snowboarding. LIGHTWEIGHT PREMIUM CONSTRUCTION - Weighing in at under 18 ounces, the Drift snowboarding helmet is on average 25% LIGHTER than competing products. It is made using advanced manufacturing techniques with composite foam technology. The result is one of the highest performance, lightest weight helmets on the market. Meets ASTM F2040 standards. COMFORT COMFORT COMFORT - You'll be hard pressed to find a more comfortable snowboard helmet. Our ultra plush interior liner provides maximum comfort and insulation. The ear pads are audio compatible (check out our new Wildhorn Alta Bluetooth helmet compatible earphones) and can also be removed for those warmer Spring ski days. The Drift also features our FTA (Fine Tune Adjustment) system that offers micro adjustments for the perfect fit. The Drift ski & snowboard helmet were designed by skiers and snowboarders in the shadow of the Wasatch mountains in Utah, home of the greatest snow on earth! We set out to create a premium helmet at a price anyone can afford. We accomplished this by cutting out the middleman and selling direct to our consumers. The Drift Helmet is packed full of premium features only found in higher priced helmets. Wildhorn is an official equipment supplier of the US Ski team. We are proud to also sponsor 3 time Olympian & 2017 World Champion Ashley Caldwell. Ashley is the only woman in the world to ever land "The Daddy"- a quadruple-twisting triple backflip in competition. We build our reputation by creating quality product. If you experience a problem that is a result of defect in materials or workmanship, Wildhorn Outfitters warrants your helmet for the lifetime of the product and will repair or replace your helmet at no charge. Warranty does not apply to damage resulting from impact, misuse, abuse, accident, negligence, or normal weather wear and tear. Wildhorn Outfitters has the sole discretion to determine manufacturer's defects.